With the start of a new school year comes a new set of challenges for our students and staff. One of the major challenges for us as a school is ensuring the rigor of our curriculum is commensurate with the expectations of the Common Core State Standards. Our staff quickly saw that the path to this more robust set of skills could not be achieved by relying solely on the tried and true methods of the past. What our teachers started over the Summer of 2013 was truly remarkable. Willard teachers gathered together over the summer months to collaboratively plan a themed curriculum that connects to our PBIS model of "SOAR Like An Eagle (i.e., where SOAR is an acronym for Show Respect, Ownership, Attitude, and Responsibility.)" 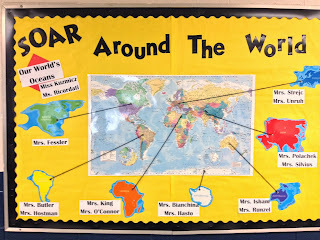 During the 2013-14 school year, Willard is "Soaring Around the World!" 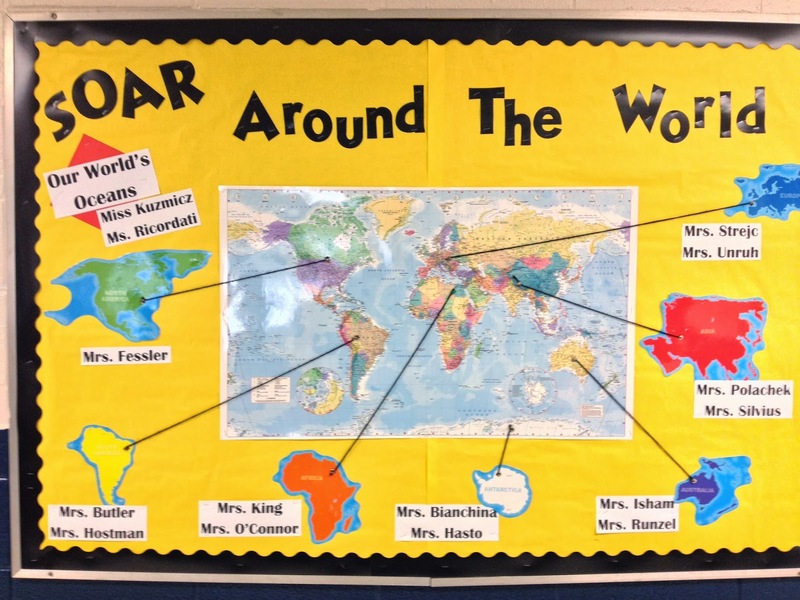 Every grade level has chosen a specific continent to focus on, and students will be researching climate, native animal species, different maps (e.g., topographical, geopolitical, etc. ), languages, and the cultures and traditions found in the countries located on that continent. To this end, Willard is looking to set up Skype chats with classrooms on each continent! We have established a Skype lesson, and are eager to make connections with students around the world. Please do not hesitate to join our lesson or contact us via email if you are interested in connecting with us via a Skype chat. Have fun with Doctopus and Goobric! They are truly great tools that help with organization, grading, and communication. How have you used them thus far? A few weeks ago, I detailed my first adventure with app creation. Knowing that my staff and I were going to have to ramp up our implementation of the Common Core State Standards and also knowing that states across the country have already created tools to facilitate implementation of the standards, I developed an app, CommonCoreResources, that is intended to organize and identify the many tools that are being used across the country. To build the app, I used The App Builder, which is a very intuitive and user-friendly tool. To be truthful, most of the work involved was in gathering information and planning the layout, not in actually building the app itself. With the minor exception of having to insert some HTML code into text fields to insert links, the tool contained absolutely everything I needed. 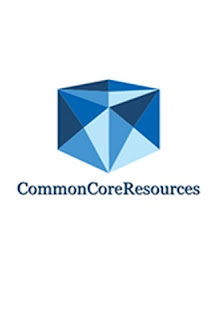 Much like the CommonCoreResources app is designed to be a one-stop-shop for all things Common Core, the Willard School app serves a similar function relative to information about Willard School. Any announcements and upcoming events can be shared with the school community and updated immediately. The app provides increased communication and contact with our school families. While I make weekly calls to parents to provide an overview of the upcoming week, the app provides our families instant access to any school-related information, whenever they are looking for it. It ensures our doors are always open to them. Although I am looking at Schoology as an exciting option for our school's Learning Management System (that offers a plethora of communication options), the app also provides increased contact points for our staff, both with our families and with each other. In short, there are lots of benefits for having an app for your school. 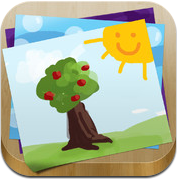 It is fairly easy to create and update using The App Builder. I'll keep you posted on how the app is received by the school community once it's launched. Also, the logo above was created using the InstaLogo app. Design elements are particularly challenging for me, and although a bit pricey, the app did produce exactly what I was looking for with minimal hassle, which made it worth the cost. 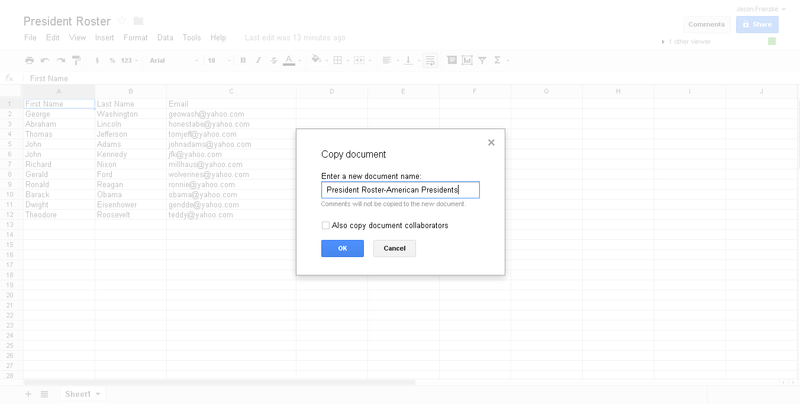 In a previous post, I explored the script Flubaroo and how it streamlines assessment creation and grading in Google Docs. Flubaroo and Doctopus were both buzzwords that I initially heard about from other tech friends. They seemed like things I should learn and know about, so at a recent conference I attended a session on Google Docs and the Common Core presented by Mark Fijor. 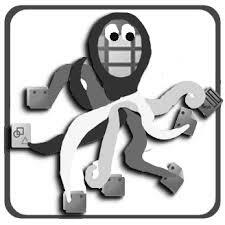 At the session, I learned enough about Doctopus to know that I needed and wanted to know a lot more. 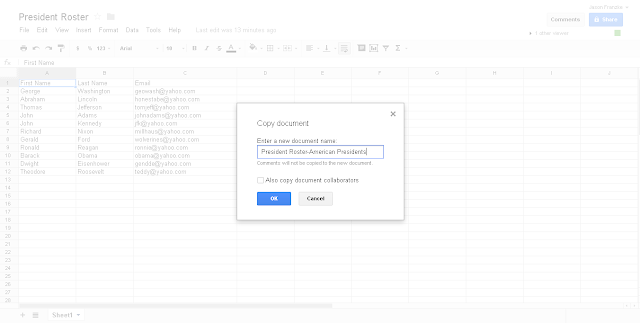 I finally had a chance to explore a bit with Doctopus and see just how helpful it can be in distributing, collecting, and organizing content in Google Docs. 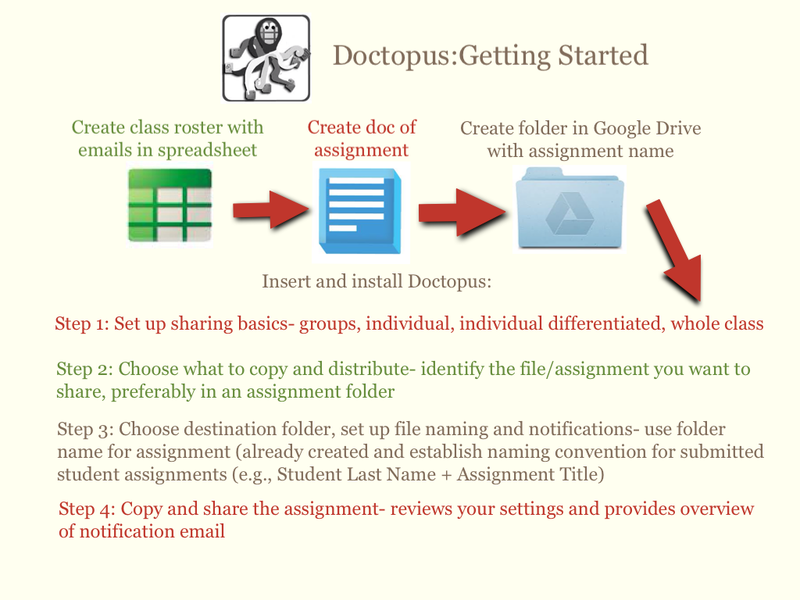 Step 2 prompts you to choose what to copy and distribute by identifying the file you want to share, which is preferably stored in assignment folder. Step 3 asks you to choose your destination folder and to set up file naming and notifications. If you have set up a folder already (in a previous step) simply use that folder name for your assignment, and establish naming convention for the submitted student assignments, e.g., Student Last Name + Title, etc. There is also a prompt for the email notification subject line and a personalized note to include with the email message. I am definitely excited about sharing Doctopus with my staff. It seems as though what Flubaroo was to multiple-choice and true-false assessments, Doctopus is to extended- and constructed-response assessments, as well as a valuable tool for Google Docs organization! A couple of weeks ago, I had an idea to start an after school club for our intermediate grade students. We currently have 30+ iPads deployed at our school of just under 400 students. Most of those iPads are in use during the day in centers in our primary classrooms. We are currently building an iPad classroom to house all of those iPads and to ensure access for all students to the devices, but until that time, our intermediate students seemed to be missing out on a great opportunity. Over the course of the year, most of our students have been working on longer writing projects. They have been writing and editing stories that they have spent months working on. Why not provide those students with an opportunity to publish their stories using the iPads? From this idea came our school iPad Authors Club. Twice a week, our students gather with their finished stories to publish their work using the Book Creator app. It was in the device management aspect of this work that an idea occurred to me involving Dropbox. Since the students were not consistently using the same device from one session to the next, we needed a central location for students to be able to save their work and access their work the next time they came to class. Enter Dropbox. 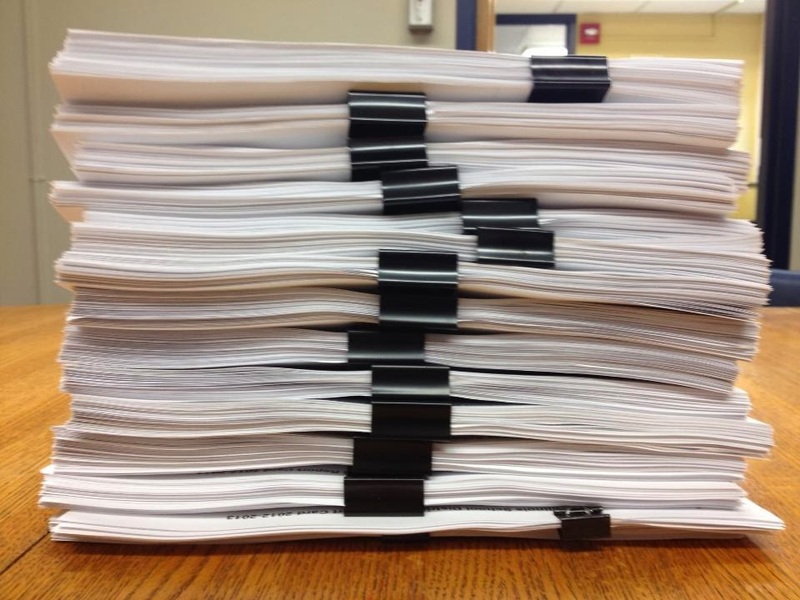 From a school account, all of our teachers have their own folders to which they can save their own work (or their students' work.) I created a folder for the students in the club. They are prompted to save their work to the Dropbox, and access the Dropbox at the start of class to resume their work right where they left off. Device management issue solved! It was here that the idea occurred to me that this solution could potentially be extended to our classrooms that are utilizing a limited number of iPads. If students are working on a project in a small group, access to the Dropbox would enable the students to work collaboratively from anywhere they have access to the Dropbox. Face-to-face classroom time could be used to plan specific tasks/functions for each group member, who would then be able to complete the task anytime and anywhere they have access to the shared Dropbox folder. 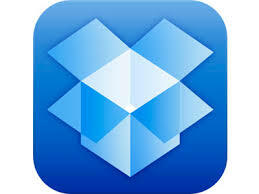 Maximizing instructional time and increasing collaboration-it's a win-win using Dropbox! Over the past year, we have worked to integrate the iPad into our curriculum in a number of ways. We were initially able to place some iPads in each of our primary classrooms, which enabled our primary teachers to utilize them for interventions or enrichment in centers. The students responded to the introduction of the iPad in dramatic fashion, as they were all completely engaged and were actively working to support each other's work on the devices! 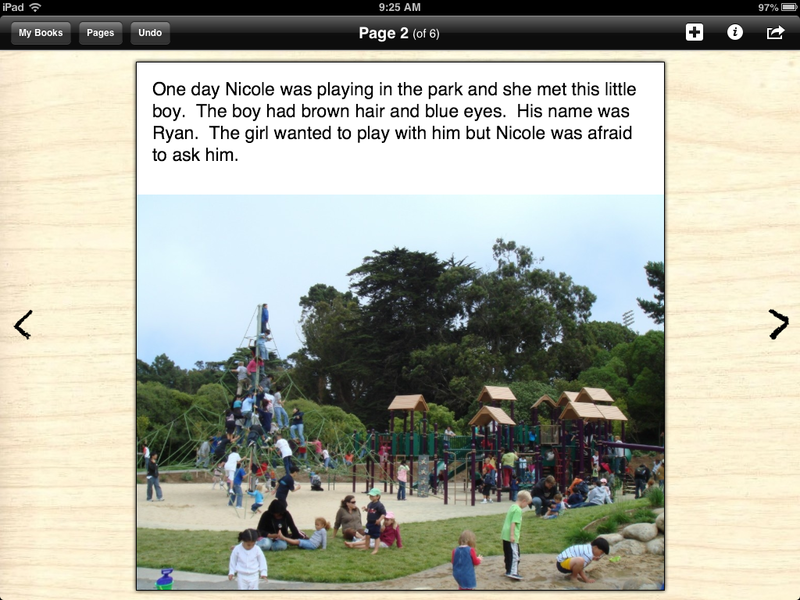 One of the projects the students were working on involved creation of their own iBooks. 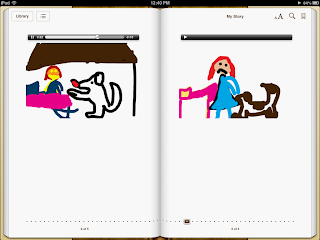 The students wrote their own stories first, complete with illustrations, and then used the My Story app ($1.99 in iTunes) to bring their stories to life. My teachers inspired me to start an afterschool club for students in our intermediate grades who also wanted to publish stories they have written on their bookshelves as iBooks. We were considering a number of apps to use, including ScribblePress ($3.99 in iTunes), Book Creator ($4.99 in iTunes), and Creative Book Builder ($3.99 in iTunes.) I did like the easy integration of art into ScribblePress, as well as the ready-made templates. Creative Book Builder has clearer integrated structure with chapters, table of contents, and glossary options included, along with the ability to add text and media from almost any source imaginable. Books can be published to iBooks, Dropbox, and Google Drive (among other options.) In the end, we opted with Book Creator as a "happy medium" of the options. Our students and our school are still in a nascent stage in working with these apps, but I am incredibly excited by the students' enthusiasm, engagement, and work thus far! Who knows what great future author we can inspire? In looking ahead to the 2013-2014 school year, I still find one very large and expensive item remaining from my teachers' initial needs assessment/wish list for their classrooms from this past school year: a teacher laptop for every classroom. Laptops come in all shapes and sizes, different models and features, and with all sorts of bells and whistles. As I explored, I discovered Chromebooks, which seem like a very attractive option for a number of reasons. The Samsung Chromebook tops out at $249, meaning I can obtain one for each classroom very inexpensively. 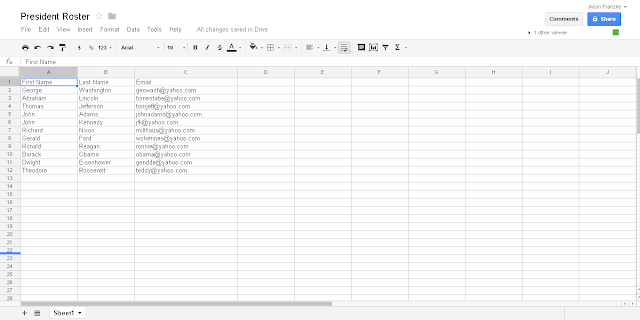 The options for collaboration through Google are exceptional, and everything is backed up to Google Drive. So what's the tricky part? No Windows operating system. No Microsoft Office! Flubaroo actually saves the teacher significant time in grading and provides multiple options for data use. It functions flawlessly with multiple-choice and true-false questions. Open response questions are trickier. For example, if the correct answer to a question is "6," a student response of "six" will be marked as incorrect. Similarly, if the correct answer to a question is "George Washington," any variation on spelling and/or grammatical conventions will also result in a wrong answer. Perhaps that's a risk we're willing to accept, but forewarned is forearmed. In the meantime, I am eager to share this tool with my teachers! I think it will make our work a bit lighter and potentially even more effective. At a recent conference presentation given by Ms. Jennie Magiera, I learned about "screencasting" using an app called Ask3. After having the chance to explore with the app, I was amazed by the app's potential to increase the teacher's accessibility to struggling students in the classroom, as well as its viability as either a formative or summative assessment tool. How does the app work? When you open Ask3, there is a camera tool built into the app. You can take a picture of a problem or task, and then record a mini-lesson with your own voice as you annotate (write and/or draw) onto the picture you took in real time. It is literally just that easy. Within minutes, you have a video mini-lesson ready for classroom use. The app's layout is very intuitive and user-friendly. So what is the potential benefit to the classroom? Let's say you're getting ready to teach a lesson on a new concept, like fractions. In planning for the lesson, you would anticipate that there are a number of areas (both conceptual and procedural) where students may struggle with fractions. 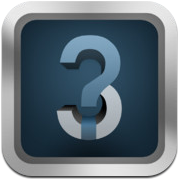 Using Ask3, you could record any number of mini-lessons to build upon student prior knowledge. Those mini-lessons could then be accessible to any student during the lesson with access to the app. Students who are struggling can seek the answers to the questions they have from their own teacher, at the same time. Talk about maximizing instructional time! From a management perspective, once the mini-lessons are recorded, they are always there. They can become part of a library of instructional mini-lessons that will always be at the teacher's disposal. However, the app can really take flight when students are empowered to record their own responses using Ask3. Students can use Ask3 to articulate their mastery of a concept taught in class, or even to create a response to an instructional task. The student's narration provides an otherwise unseen window into the student's understanding of a concept, which will make the teacher's follow-up planning that much more effective. With the clear benefit to teachers and students, we will definitely be exploring more with Ask3! For quite a while, I have been searching for a mathematics app that is able to not only teach procedural fluency, but also address the underlying conceptual understanding that is so important. There are some great apps out there, but most of them invariably fall back to a default reliance on teaching procedures, which to me looks much too much like traditional mathematics instruction. Therefore, I was thrilled to find the DragonBox+ app. 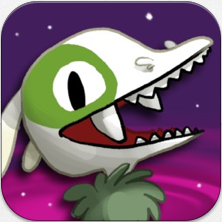 * The app actually teaches algebra and has a lot of mathematical concepts embedded within the game. The app is very visually appealing and is highly intuitive. Students can solve puzzles without even realizing the serious mathematics that lies underneath. For example, on just the first level, students are already applying the inverse element, exploring what an equals sign means, and solving equations. At first, the students solve to get a treasure chest by itself. By puzzle 18, the treasure chest becomes "x." The scaffolding of content here is terrific. At first students are working with symbols, which then become numbers and variables. More complex concepts are added, such as fractions and the multiplicative identity element, but the app maintains a sufficient level of challenge and continues to engage students throughout. The mathematical concepts presented here can easily be supplemented by a number of extension activities outside the app to further develop mastery. For those that think algebra is only for middle school and high school students, let your primary students explore with DragonBox+ and let algebra happen! *I should note that I am not being compensated by DragonBox+ to write these kind words. I am simply a mathematics enthusiast and former algebra teacher who is thrilled to see algebra presented in such a fun and engaging way! Today is one of my favorite instructional days, Pi Day. The concept of pi existing as a geometric ratio in its purest form, and that any numeric representation of pi is an approximation of its true value can be tricky for students to grasp. There are so many fun activities that can be done with students today to explore and learn about pi. One of the more interesting activities that I've seen done with pi was this musician's interpretation, where he converted numbers to notes to create a beautiful musical composition. 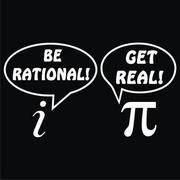 Enjoy Pi Day! UPDATE: I found some exciting Pi Day logic puzzles at Pi Day Challenge. Playing requires either a Facebook login or account creation. 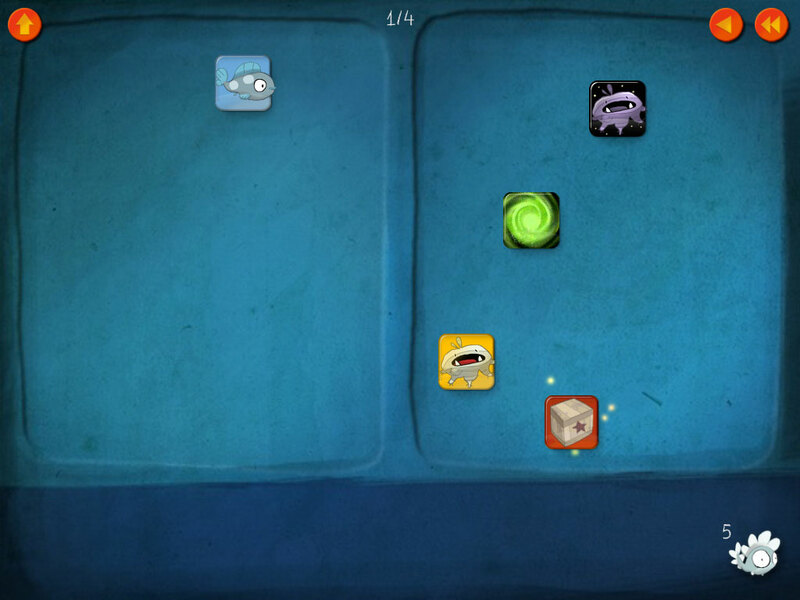 The puzzles are challenging and fun! A recent discussion with colleagues led me to reflect on organizational change and which strategies are most effective at driving such change. Whether we look at change at a district or building level, we are fundamentally looking at a pragmatic, realistic assessment of our current state, and the careful planning of action steps to achieve a desired state. There are many issues that affect change, including scale (e.g., a large district will require additional time and resources than one small school,) resource allocation (i.e., are the organization's resources aligned to support the desired change,) and perhaps most importantly, how adults in the system navigate the change process. The brilliant Richard Elmore has co-authored a book, "Instructional Rounds in Education", that in part addresses how we as educators approach our work. He compares the feedback a typical educator receives with the type of feedback medical students receive. To paraphrase, he states that where medical student conversations are more objective and clinical in nature, educator feedback is laden much more often with statements that contain value judgments. By focusing on the instructional core and providing substantive, objective feedback to educators, transformational change is possible within schools. While Dr. Elmore's work is quite profound and has tremendous implications for our work, I find myself drawn to the emotional component associated with educators and the change process. Why do so many educators take feedback personally? Why do we equate feedback on our professional practice with feedback about ourselves? Is it something unique to our work, or a natural response to the type of feedback we've been accustomed to receive? Kotter's redefinition of the change process resonates with me because it connects with how I understand substantive change to happen: an emotional response serves as the motivation to change. I have tried to incorporate many of these ideas into my own professional practice in navigating both the heightened expectations of students and educators articulated by the Common Core State Standards and the integration of new technologies into our curriculum. How have you approached change, both structural and individual, in your school or district? On a recent visit to a primary classroom, I observed students creating new words by changing the first letter(s) of the words. For example, if the word was "ball", other students could create a new word by substituting the letter c to make the word call, or the letter w to make wall, and so on. Students could create either real words or nonsense words and were having quite a bit of fun doing so. The activity was part of what was overall a very engaging and successful lesson. As I reflected on the lesson, I began to wonder how technology could potentially be integrated into the activity. As engaging as it was, the students were working exclusively with concrete materials (e.g., paper letters the students cut out, plastic letters in some cases, etc.) 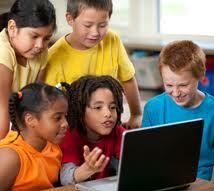 How could technology enhance our students' experiences? At the recent 2013 ICE Conference, I attended a breakout session presented by Jeff Shaw, an Academic Facilitator at North Shore Country Day School. Jeff's presentation, "Stop Motion Magic on an iPad," was incredibly informative and explored how students and teachers could create their own stop motion animated movies using the iMotion app. The process is remarkably simple: open the camera within the app, take a picture, move items in the picture about a centimeter, take another picture, move items again, take another picture, and repeat. When your movie is finished, save to the Camera Roll and open it in iMovie to edit and/or add background music or sound effects. Ta-da! Easy, right? Lock the camera/iPad in place. I tried holding it over a white background and moving the items with my free hand, and you can clearly see the camera's movement from one frame to the next. Think carefully about the process skills students will need to make their own movie, and how those skills will be modeled and taught to students. Some of the greatest discoveries can only happen when there is freedom to explore! 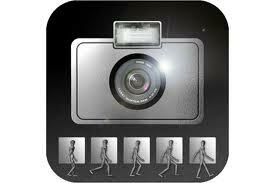 Looking forward to integrating stop motion animation using iMotion! Mr. Mitra's vision is inspirational and aspires to answer a central question of modern day education: how do we prepare and educate the children of today for their jobs in the future, many of which do not exist yet? Mr. Mitra's answer is to develop Self Organized Learning Environments (SOLE) environments where inquiry-based learning is not only the foundation, but the linchpin of the learning experience. Mr. Mitra's experiences with his "hole in the wall" experiments offer compelling evidence for students' ability to take ownership of their learning and think critically. In the midst of all of these positives, I find myself returning to one of Mr. Mitra's central questions: Is knowledge obsolete? Of what value is knowledge, if computers can recite any fact much quicker and more accurately than the human memory? I agree with Mr. Mitra that most of traditional educational pedagogy is centered around either learning facts or the application of rote procedures to solve problems. The creation of the type of dynamic learning environment that is central to Mr. Mitra's vision represents a significant break from this traditional approach, where the teacher is the center and appraiser of all knowledge in the classroom. Herein, however, lies the conundrum. How does the learning in the SOLE environment happen without that knowledge source in the classroom? While a computer can introduce a task, it is the human element that assesses student need in real time, asks the appropriate guiding question to refocus the group, and provides words to reassure or challenge students based on individual needs. Technology can do a great many things, and that number of things increases exponentially with each passing year. However, it cannot yet diagnose a student's academic and social-emotional needs in real time and know exactly what to ask or say to comfort, challenge, or motivate a student whose learning has stalled (e.g., the "encouragement" and/or the "granny cloud" that Mr. Mitra references). It is the human connection that matters most. What will those connections look like in the future? I attended the recent Illinois Computer Educators' Conference in Saint Charles, Illinois, and was absolutely amazed by both the depth and quality of the presentations. I am the principal of a K-6th grade school in South Elgin, Illinois, and thought we were starting to implement some exciting things related to technology. We procured a classroom set of iPads using external grants, document cameras for every classroom, and have significantly upgraded our building's tech infrastructure. All great first steps, but when I saw the incredible things that are happening out in the educational landscape, I saw just how much more was possible. I was inspired to start this blog to chronicle our journey through a full tech upgrade at our school, from resource procurement and management to changes in pedagogy using technology. We are all collectively taking our first steps toward tech integration and implementation. Some big questions remain in front of us. Resource questions: Chromebooks or laptops? Schoology or Edmodo?How many iPads? Which apps? Pedgogical questions: How to best integrate technology given the more rigorous expectations of the Common Core State Standards? How to define the content (i.e., what students should be able to know and do at every grade level, although the PARCC Model Content Frameworks help there) and process (i.e., what skills students need to demonstrate their content mastery) skill gaps at every grade level, and create and implement plans to address those gaps by the 2014-2015 school year? When I've got that figured out, I'll let you know. In the meantime, we're on the path!